I want you to meet a friend of mine - he's decided to eat healthy. You wanna know how much sugar* there is in a "healthy" day like this - A grand total of 80g of sugar in a single day! On a "healthy" diet, no less! Forget macro-nutrient ratios, forget grain intake - focus on the 80g of sugar! High sugar consumption leads down a path where the star attractions are cardiovascular disease, fatigue, diabetes, obesity, and their friends. It is estimated that Americans consume about 90g of sugar every day, and looks like my "healthy" friend is a lot closer to being tubby than healthy. I hope his question of "Where's my six-pack at?" is answered now. * not carbs, even though carbs are sugar. You get what am trying to say The Sugar High We eat so much sugar today that our senses are blunted by it, and we require more sugar to be stimulated. It is an addiction! Sugars have a high reward value associated with them, by increasing dopamine and serotonin levels. And once these levels go down, your body starts craving more sugar, to get back the same "sugar high". Next time you get up to get your fix, think about that. I stopped eating sugar "cold turkey". One month after doing that, I was able to taste so much more flavours in everyday foods, and other foods that I had regularly consumed tasted way too sweet and inedible. The purpose of this post is to show you that many "healthy" foods that we consume are anything but! I will illustrate this point by comparing the sugar content of those foods, side-by-side with foods we (hopefully) know are not that good for us. And once you're alarmed enough, and ready to put down that cookie (or jalebi), I'll help you get your facts straight and get you started on your path to a healthier relationship with your favorite monster - sugar! Just to be clear — both sets of foods are sugar monsters that don't do you much good. Eat Real Food instead, and you're golden. If a serving of food contains more than 15g of sugar, it is closer to dessert than to food. If you want to know why sugar ain't a great thing, watch the video below. [hr] Let's look at sugar content in some food items, at a regular serving size. The foods in the "healthy" corner are - your protein bar, your morning cereal, your awesomely healthy sandwich at lunch. The evil guys over at the unhealthy corner are - the oh-so-delicious gulab jamun, and India's favourite snack - Good Day biscuits. Warning: Graphic content follows. [caption id="attachment_1367" align="aligncenter" width="412" caption="L to R: The healthy team (protein bar, breakfast cereal, Subway sandwich); The evil team (gulab jamun, biscuits)"] [/caption] A Clif Bar, or similar protein/health/cereal/whatever bar has 25g of sugar per bar, which is more than the amount of sugar in a single jamun! Isn't that ridiculous? And your healthy lunch (a Chicken Teriyaki or any similar "guilt-free" sandwich at Subway) has about the same sugar as eating a few Good Day Biscuits! Most "heart-healthy" cereals aren't that much better. In case it wasn't obvious, every food item here is above the 15g=dessert bench mark. [hr] Same thing now - let's look at some beverages. [caption id="attachment_1366" align="aligncenter" width="409" caption="L to R: The healthy team (freshly squeezed orange juice, Gatorade, Complan); The evil team (beer, coke)"] [/caption] About 300ml of freshly squeezed orange juice contains 30g of sugar - more than a 330ml can of Coca-Cola. 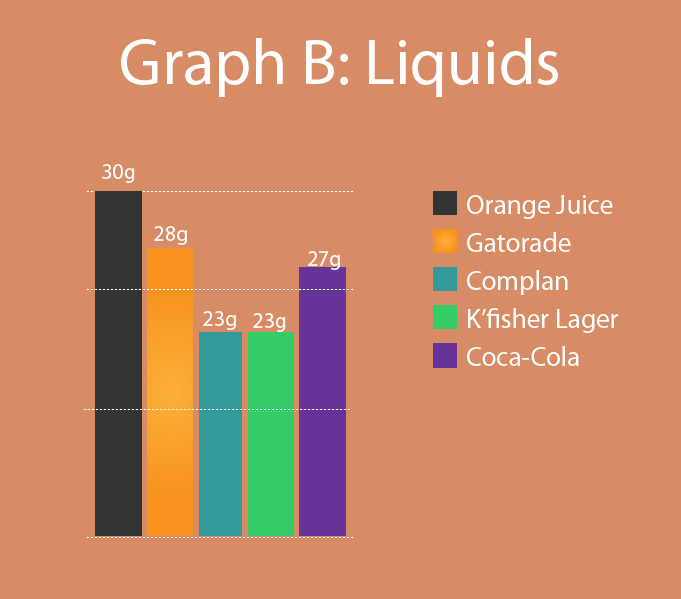 Gatorade and Complan aren't any better - and in fact, have higher sugar content than beer! Again - way above the 15g=dessert benchmark. [hr] **You know my methods, Watson. **- Protein bars = candy bars. Stop eating them. Eat an apple instead. Read the nutrition labels for all the foods you buy. Cereals contain a lot of sugar - be careful when you pick one. And yes, there are certainly healthier options than cereal for breakfast. Try to eat fruits in a form that closely resembles how it looks on a tree. Juices, jam etc., just fruit-flavoured sugar. Yes. One really fat dude lost a ton of weight eating at Subway. This dude lost 27 pounds eating twinkies - wanna give it a go? I'd rather eat a gulab jamun after my post-workout meal, over a Clif bar pre-workout! Biscuits. Oh biscuits. Why do I wanna punch you in the face and stuff you in my tummy at the same time? Did you know diabetics are told that it is okay to consume biscuits regularly?! Ridiculously stupid people like this are the reason my diabetic mom stocks biscuits as a snack - I get my sister to throw them out when she can. Coconut water > Gatorade. Hands down. Liquid foods are an easy way to over-consume calories. Stick to solid foods whenever possible. Stop drinking soft drinks, if you haven't done so already. Sugar-free or not, they are crap for you. If you are a Complan boy/girl, it is about time to grow up. Doubt if Bournvita, Boost etc are better. Do your homework. Eat just one tablespoon of coconut oil, or butter, or ghee. This might work for some people, and satiate their sugar craving. Eat more protein, and fats in your meals. A well-balanced meal will keep you fuller for longer, and stop you from reaching for that cookie jar. Reduce cardio, and aerobic work. This makes you crave sugar, as you are depleting your supply of glycogen. Switch to resistance training instead. Eat more starchy vegetables. Starchy veggies are your best source of carbs! [hr] This post is inspired by a similar post over at Summer Tomato. I am going to use the same benchmark as her, the 15g of sugar. A relevant excerpt from the post, > In her book What To Eat, Marion Nestle, professor of nutrition at NYU and blogger at Food Politics suggests that any food that contains more than 15 grams of sugar per serving is closer to dessert than anything else. Though this number is arbitrary, it is a good benchmark for evaluating food products. 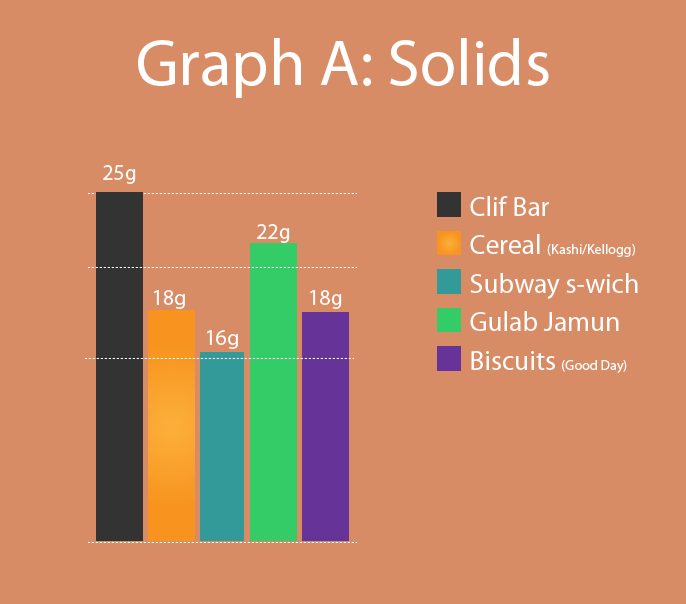 Note: How I came up with the numbers for the graphs: Some are straightforward - via the nutritional information. For some, I picked a recipe that is representative, and calculated the sugar. And I am not using the serving sizes that the box recommends, coz that is nowhere close to the actual servings one eats. The box serving size is simply there to fool you. [hr] Please share this post - via Twitter, Facebook, and whatever crazy new things that you kids are using! Thanks peeps, and Happy Monday!